... our first Caribbean land fall back in November at the end of a six day off shore passage from Bermuda. 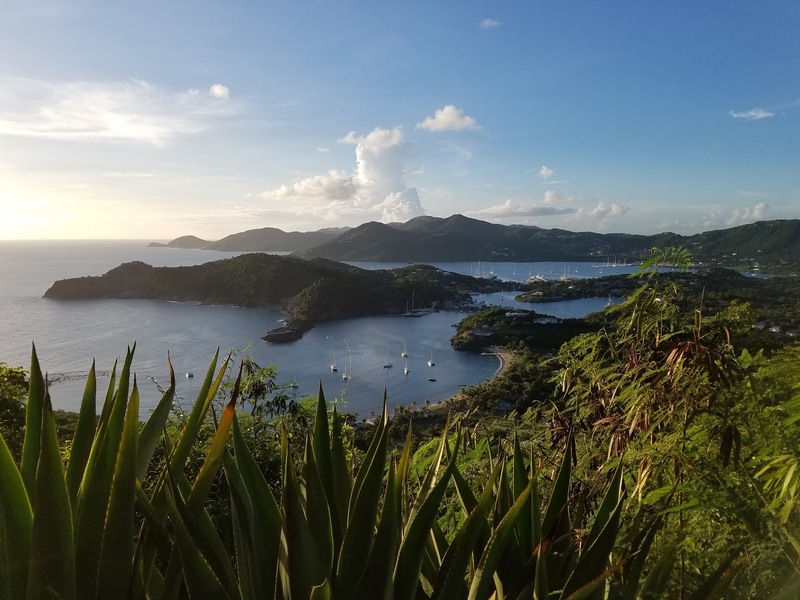 After a joyful week recharging on this partially mountainous island we ventured south to explore the islands of Dominica, Les Saintes, and Guadeloupe only to return to Antigua a couple weeks ago for a longer stay. I could get used to this island, or perhaps I already have. English Harbor at the southern end of Antigua quickly became our comfort zone and home base; we explored beyond primarily by land - walking mostly, but also via rental car and the adventurous public transport mini bus that manages to cram in an amazing number of passengers. I loved anchoring in the clear water of Freeman's Bay jumping off Argon in to the reliably warm and clear water more times than I can count to swim, snorkel, check the anchor and bathe. View of our anchorage in Freeman Bay English Harbor from atop Shirley Heights. Excellent hiking trails weave through these hills. Argon spent many nights on the hook in Freeman's Bay in English Harbor. We loved the view and immediate access to swimming. The conditions were sometimes tricky with variable holding and intermittently numerous neighbors. The dinghy was in constant use when we were at anchor to shuttle us between Argon and Nelson's Dockyard and Galleon Beach. Snorkeling between Argon and Galleon Beach. 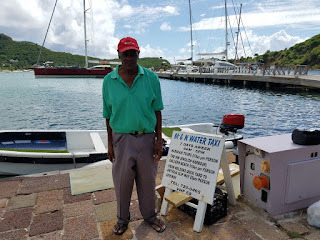 Excellent Dockmaster at Nelson's Dockyard and all around great guy, Sherwin. It was fantastic to quickly meet several trusted locals for advice, guidance, and conversation. 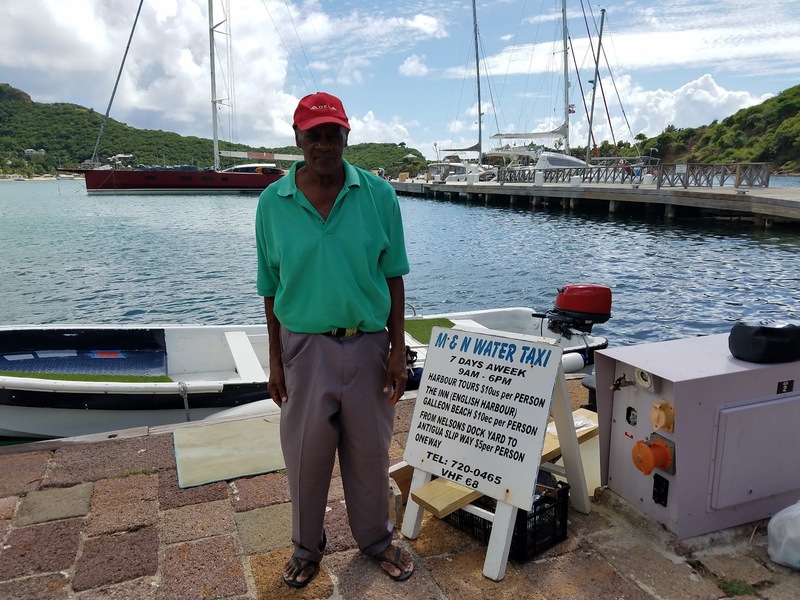 Mannix (aka M&N) runs a water taxi and superette and is always up for a chat. Mannix is a great source of local information and various boating related advice having spent many years on yachts. There seems to be a very friendly, casual interaction among most everyone on the island with comfortable greetings and easy conversations. It did not take long to connect with several locals. As with many Caribbean Islands, in addition to English, there is a local dialect spoken quickly that is still considered English but which I cannot yet understand. Christian helping to pick out some fresh produce from Aubrey's local stand. I have been enjoying the local Caribbean produce including making fresh passion fruit juice - by simmering the juicy seeds in hot water and straining. Fresh passion fruit juice is great over ice or kicked up with a splash of vodka and tonic and a squeeze of lemon. 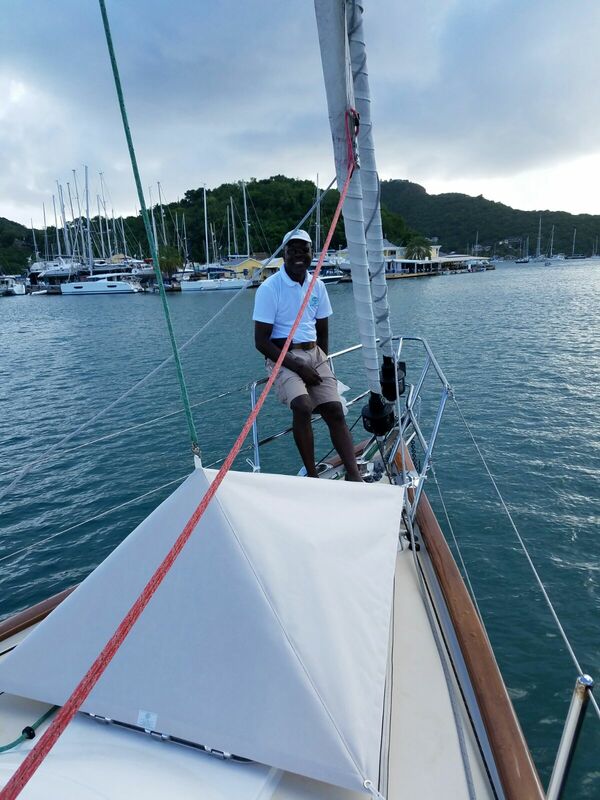 Franklin from A&F Sails, Ltd. at Nelson's Dockyard efficiently made a custom hatch awning for Argon so that we can keep the large forward hatch open when away or sleeping for needed ventilation (it's hot here!) without fear of drenching our V berth when one of the frequent rain storms pass by. Cheeky Marlin is a funky beach bar overlooking Argon's anchorage in Freeman's Bay. Rupert and Tina recently opened this inviting and eclectic watering hole with unforgettable sunset views. We spent quite a bit of time in Nelson's Dockyard which dates back to the early 1700's. Largely built by slaves, the site was chosen due to the topography of the harbor... it faces south with protection from the prevailing easterlies and so that the English could keep a good eye on their French neighbors in Guadeloupe; in addition it is quite protected from severe weather with rising hills around and a relatively narrow opening. Nelson's Dockyard is now part of a national heritage site in Antigua that includes the nearby Clarence House and Shirley Heights. The stonework throughout is amazing. I especially liked how this is a working marina that continually hosts many visiting yachts and sailing events, has a sail loft, bakery, restaurants, small grocery store for provisioning, and access to various types of expertise needed by sailors. It is a very popular tourist attraction luring large number or cruise ship passengers and other visitors down from St. John's on the northern part of the island. Copper and Lumber restaurant and hotel used to store supplies for the dockyard in the 1700's and 1800's. Many, many high end, impressive sailboats in both English Harbor and nearby Falmouth Harbor. Perhaps the highlight of our time in Antigua was having my younger son and his girlfriend spend a week with us. After splurging for a couple of days at the fancy Saint James Resort, Christian and Brittany sampled the nautical life staying aboard Argon. Christian and Brittany exploring the impressive (and dangerous) Devil's Bridge on the eastern side of the island south of Long Bay. Christian and Brittany joined us for a short but rigorous sail from Mamora Bay back to English Harbor. It was only several miles but the winds were 25+kts and the seas were 8-10 feet. We ended up tying up to the dock (med moore style) at Nelson's Dockyard instead of staying out on anchor for ease of coming and going and to avoid getting tossed around too much while guests were aboard. We had about as close to a perfect week together as a mom and son can expect. Really special. 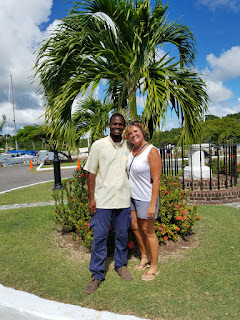 Another friend from back home... Melissa recently sailed from the states to Bermuda to Antigua (again) and is staying nearby in Falmouth Harbor. 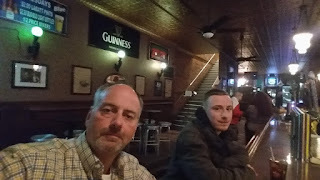 Bob took this time of being stationary in Antigua to head back stateside to get some time in the office at work and visit his son Jon in upstate NY. He flew out on the 20th and returned on Christmas day. The return was not straightforward as he ran into a bit of a snag at the airport. Without documentation of a return flight, they were not going to let him leave the country! After explaining/arguing enough with the airline employee and her manager, I sent Bob a totally illegible photo of the crew manifest document from Antigua Customs. By that time, they were tired enough of arguing that any document would do so they let him return. He still is complaining about the cavity search though. Bob left the warm sunshine of Antigua traveling back to New England for work and, importantly, to bar hop with his now 21 year old son, Jon. End of one of the many hiking trails. This one terminates on a patch of rough volcanic rock overlooking ragged cliffs peering southeast. One of many breathtaking sunsets. The volcanic island of Montserrat is on the horizon. Montserrat ended up being our next destination after Antigua. More on this enchanting island later.